GoFundMe Provides Refunds To Donors Duped By Viral Campaign More than 14,000 donors were tricked into paying for a couple's vacations and handbags by a heartwarming story featuring a homeless veteran. Now GoFundMe has returned their money. 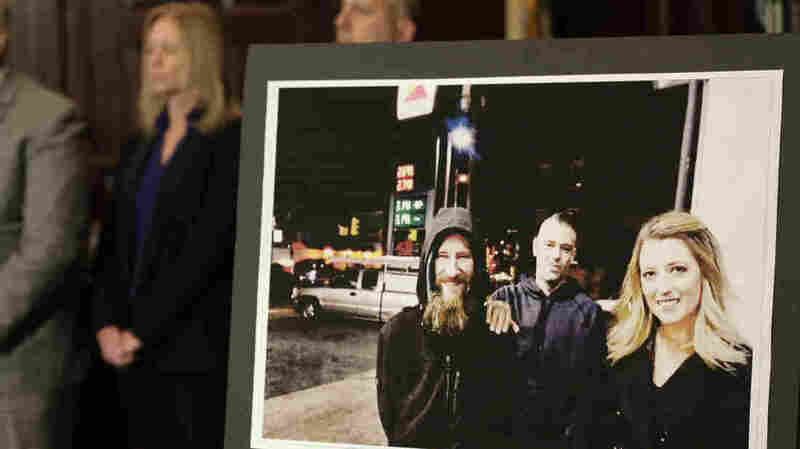 A picture of (from left) Johnny Bobbitt Jr., Mark D'Amico and Katelyn McClure was displayed during a news conference in November. For thousands of donors lured out of their money by an allegedly fraudulent GoFundMe campaign featuring a homeless veteran, the winding ordeal has finally come to an end. GoFundMe says it has returned more than $400,000 donated to a heartwarming fundraiser that captured national attention, attracting more than 14,000 donors, before taking a dark turn earlier this fall. "All donors who contributed to this GoFundMe campaign have been fully refunded," wrote Bobby Whithorne, a spokesperson for the company, in an emailed statement. "GoFundMe always fully protects donors, which is why we have a comprehensive refund policy in place." The story started last year with a serendipitous-but-fictitious encounter between a young New Jersey couple and a homeless veteran and ended with felony charges for all three people involved. The criminal cases are still pending. On the original GoFundMe page, Katelyn McClure claimed she met veteran Johnny Bobbitt Jr. when she was stranded without gas on a Philadelphia highway. The former Marine and paramedic used his last $20 to fill her tank. McClure's boyfriend, Mark D'Amico, later returned with her to take a photo of the pair that went viral. Media outlets and the public were hooked on what prosecutors would later describe as an "irresistibly heartwarming" story. The original GoFundMe blew through its initial goal of $10,000, eventually raising $403,000, and McClure and D'Amico made the rounds on daytime television, including an appearance on Megyn Kelly Today. Then the joyous affair came to a screeching halt. "The entire campaign was predicated on a lie," Burlington County Prosecutor Scott Coffina said at a news conference in November. McClure, D'Amico and Bobbitt were charged with second-degree felonies for allegedly fabricating the story that sparked the GoFundMe, Coffina said. "She did not run out of gas on the I-95 off-ramp, and he did not spend his last $20 to help her," said Coffina. "Rather, D'Amico, McClure and Bobbitt conspired to pass off a fake feel-good story that would compel donors to contribute to their cause. And it worked in a very big way. But it was fictitious and illegal, and there are consequences." Bobbitt himself had called attention to the deception, when he filed a civil suit against the couple this summer, claiming they mismanaged the money that was intended for him. Bobbitt's complaint launched a criminal investigation, which led authorities to discover text messages confirming that the initial story was a hoax. While some of the money reached the veteran, McClure and D'Amico had spent the majority of the crowdsourced funds on luxurious vacations, handbags, casino visits and a BMW, as NPR's Vanessa Romo reports. GoFundMe promised last month that it would refund donors who unwittingly contributed to the couple's personal bank accounts. The company has said it is also cooperating with law enforcement officials. GoFundMe says that cases of misuse are rare on the platform, accounting for less than a 10th of a percent of all campaigns. "We have a zero tolerance policy for fraudulent behavior," Whithorne wrote. An earlier version of this story incorrectly said Johnny Bobbitt Jr. filed his lawsuit last year. It was filed this past summer.